Who are the people who run or contribute to AFANA and how to contact us? What are AFANA's policies and principles? We are editorially and financially independent organization. We have content sharing agreements with World Footy News. We have a cooperative relationship with Fox Sports, the Australian Football League, AFL Films, and Rightster but we are not an affiliate or subsidiary of these organizations. 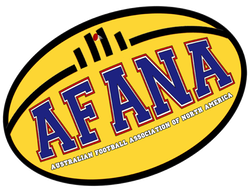 We are the preferred schedule provider for information on AFL matches on television in North America. We receive commissions on sales of WatchAFL Global subscriptions sold through our links from Rightster on behalf of the AFL.